Some homeowners hesitate to install alarm monitoring in Orlando because they don’t want to spend the money, but be aware that not installing one could cost you so much more. So today we’re sharing the top seven reasons why you should install a home security system – or upgrade your existing one – today! 1. Protect your family from intruders. The most important reason a homeowner should install a home security system is that it offers protection from intruders. 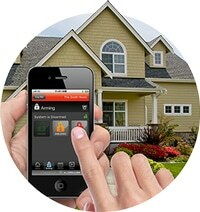 Homes without alarm monitoring in Orlando are almost three times more likely to be targeted by a burglar. This indicates that the mere presence of an alarm system is enough in most cases to protect the home and its inhabitants from break-in. 2. Protect your home and family from fires. According to the U.S. Fire Administration, in just thirty seconds a little flame can turn in to a full blown fire. While many homeowners rely on smoke alarms to warn them of a fire, home security systems offer an early-warning system. Monitored home alarm systems will not only warn residents of the presence of smoke in the home, but they will also warn of sources of heat and contact authorities. 3. Protect your home’s occupants from carbon monoxide poisoning. Because carbon monoxide is unnoticeable by the human senses, individuals are often caught off guard by carbon monoxide poisoning that has been accumulating over time. Similar to a home alarm-monitored smoke detector, emergency services will be dispatched and paramedics will be called. 4. Gives homeowners peace of mind. The presence of alarm monitoring in Orlando provides families with a peace of mind, knowing that their home is protected from a variety of devastating scenarios. When homeowners are elderly, disabled in some way or frequently left home alone, this peace of mind is invaluable. Some home security systems also provide medical alert pendants for users to wear that are designed to call for help for specific medical situations. 5. Protect valuables. From sentimental inheritances to big-ticket purchases, our belongings represent who we are and the accomplishments we have made. Each year it is estimated that there are some two and a half million burglaries across the United States. As well as signaling authorities that the home has been burgled, the cameras installed with many modern alarm systems catch the intruders in the act. 6. Your home is constantly being monitored. One of the biggest benefits to having a monitored home security system is that it provides constant monitoring even when you are unable to do so yourself. These services track significant events and dispatch emergency personnel when needed. 7. Save on homeowners insurance costs. In most cases, homeowners insurance is mandatory. The cost of homeowners insurance is typically not considered by first time homeowners when buying their home, but a substantial discount is usually applied to homeowners with alarm monitoring in Orlando. The total discount differs based upon the features of the system. Ready to protect your home and family in the most effective way possible? Call our office today and speak with one of our experts today to discuss your options for alarm monitoring in Orlando. Doesn’t your family deserve the best protection possible?